Biryanigiri is a home catering service that does, wait for it, biryani! They cater to all sorts of special occasions. Or you know, just general occasions, hogging on a plate of biryani rarely requires an excuse for us. 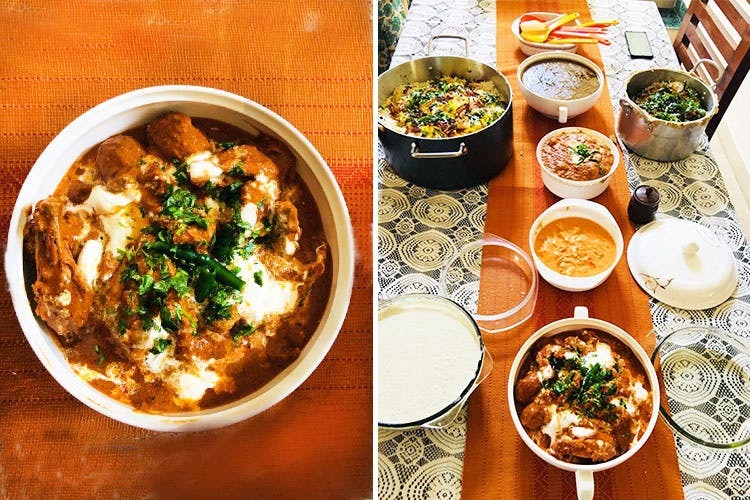 Lawyer turned chef Radhika Naithani decided to follow her passion for cooking and start Biryanigiri, a home-style catering service that exclusively prepares different kinds of delicious biryani. She customises orders (like spice preferences) and also does sample tastings for her clients. Adding a personal touch to their service, Radhika comes and delivers the food herself. We've had friends try her stuff, and they absolutely loved it. She does a bunch of different kinds of biryani, her bestseller is her mutton dum biryani. She's got your classics like dum vegetable (and it does not taste like pulao), mutton and chicken (and chicken dum), Murgh-e-Makhani, keema biryani (this one's for spice lovers) Punjabi dum aloo, dal makhani and Makhani paneer. So, with all these, you can see they've got plenty of options for vegetarians as well. So, whether you have an engagement or a birthday or even a mehendi, you know who to call. One plate costs INR 250, which includes her delicious chutney and raita. We wish she had a website to order from, right now you can place orders on her Facebook page or over the phone.